The Congo Monkey Playsystem Package #1 is a premium, ready-to-assemble polymer coated wooden playset. 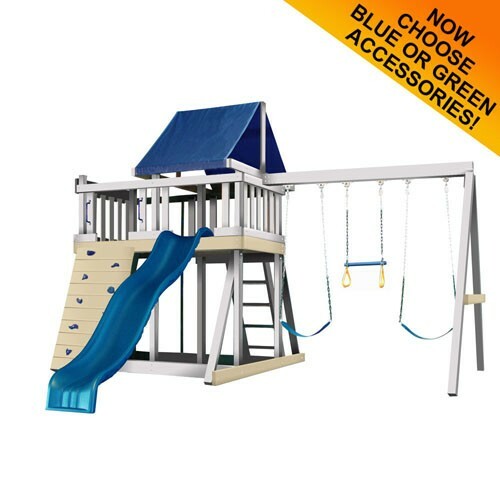 This swingset features loads of fun with the wave slide and a rock wall! To enhance your child’s play experience the Monkey Playsystem also features a huge fort measuring 4’ x 7’6”! Built with Woodguard lumber that is coated with a protective polymer making it 100% splinter free and low maintenance! It will not chip, crack, rot or peel and is UV stabilized! The Monkey Playset Package #1 is a safe, fun, and easy-to-assemble playset!